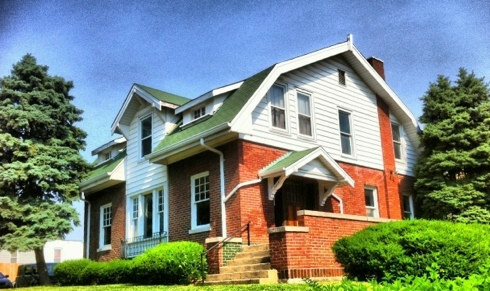 The congregation used this house for educational ministry for the next three decades. As the needs of the congregation changed in the early 1980s, so did the use of this house! In 1982 the congregation began a partnership with the St. Louis American Indian Center. For the next 20 years, the Center ran a robust food pantry and assisted tribal members with day-to-day needs. By 2001 the American Indian Center no longer used the house and it became a space for congregation and neighborhood youth again. But the congregation kept wondering, How is God calling us to use this space for mission? And in 2011, we got the spark of an idea. Several church members had been on mission trips to other cities and they began to scheme - wouldn’t it be great for mission trips to come to St. Louis? Could this house be part of that plan? The spark became a flame and the congregation got in gear, adding showers, fixing windows, painting and upgrading the kitchen. Through all of these iterations, this house has been a means of expressing God’s Beloved Community: first as a family home, then as a place of learning and faith formation, then as the American Indian Center, and now as th AMEN House. God has continued to bless Oak Hill and the Tower Grove South neighborhood through all of the varied people and ministries that have called this house home. We are blessed to welcome you here and excited about the ways you will participate in this ministry.